WASHINGTON (CNS) — The latest death penalty case to be heard by the U.S. Supreme Court was not about if a death-row prisoner should be executed, but how. 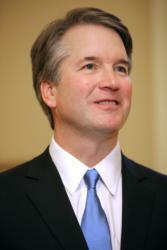 And the newest member of the court, Justice Brett Kavanaugh, could be the deciding vote on the outcome. The Nov. 6 oral arguments considered if an alternative execution method could be used on Russell Bucklew, convicted of a 1996 murder. Bucklew, an inmate on Missouri’s death row, suffers from a rare medical condition that could cause him to have severe pain if he is executed by lethal injection, which his lawyers argue would violate the Constitution’s ban on cruel and unusual punishment. In brief, the inmate has a tumor in his throat that is likely to burst during the lethal injection procedure, causing him to choke on his own blood. Missouri plans to use an injection of a single drug, pentobarbital, to carry out the long-delayed execution. Earlier this year, now-retired Justice Anthony Kennedy provided the fifth vote to stay Bucklew’s execution. In 2014, the court reached a similar conclusion. So now, without Kennedy, all eyes are on Kavanaugh. How he would lean has been an unknown factor since as a federal appeals court judge he rarely heard capital punishment cases. But in the oral arguments, his pointed questions to the state’s attorney indicated he might favor the inmate’s request for an alternate form of execution: nitrogen gas. Kavanaugh specifically asked if the state would still carry out the lethal injection “even if the method creates gruesome and brutal pain,” which the state’s attorney said it would. He also asked if the state had planned to make any special accommodations for Bucklew’s condition: if he would be lying on a gurney or with his head elevated? Again, yes. “Your opposing counsel said even if everything goes according to plan, there will still be significant suffering. Can you respond to that?” Kavanaugh asked. The state’s attorney disagreed. The decision, written by Justice Samuel Alito, prompted Justices Stephen Breyer and Ruth Bader Ginsburg to suggest that capital punishment itself might be unconstitutional. In the Nov. 6 oral arguments, Alito did not seem to believe that death by nitrogen gas would be quicker than by lethal injection. “What are the numbers? And where does that come from?” he asked. Justice Sonia Sotomayor expressed concern about the whole premise of requiring inmates to identify alternative methods of execution. She also pointed out that Bucklew’s health condition had changed somewhat since he had a tracheotomy during the summer to help him breathe.The inmate’s lawyer said the tube was still in place and he didn’t know if or when it would be removed. Breyer suggested holding a new hearing to determine whether “there really is a special problem” in Bucklew’s case.